Futurism was an early 20th-century art movement which encompassed painting, sculpture, poetry, theatre, music, architecture and gastronomy. Filippo Tommaso Marinetti initiated the movement with his Manifesto of Futurism, published in February 1909. 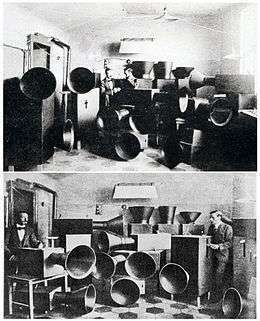 Futurist music rejected tradition and introduced experimental sounds inspired by machinery, and influenced several 20th-century composers. A collection of Futurist music and spoken word from the period 1909-1935 has been recorded on a CD, Musica Futurista: The Art of Noises, issued in 2004. As well as period recordings, including free-verse readings by Marinetti and Russolo's intonarumori, the CD includes contemporary performances by Daniele Lombardi of other key Futurist piano works. The material has been digitally remastered and includes a booklet with rare images and sleeve notes by Lombardi and James Hayward. Numerous recordings of Italian and Russian Futurist music have been made by Daniele Lombardi, notably the albums Futurlieder (works by Franco Casavola) and 'Futurpiano (works by George Antheil, Leo Ornstein and Arthur-Vincent Lourié). ↑ Benjamin Thorn, "Luigi Russolo (1885–1947)", in Music of the Twentieth-Century Avant-Garde: A Biocritical Sourcebook, edited by Larry Sitsky, foreword by Jonathan Kramer, 415–19 (Westport and London: Greenwood Publishing Group, 2002). ISBN 0-313-29689-8. Citation on page 415. ↑ Daniele Lonbardi, "Futurism and Musical Notes", translated by Meg Shore, Artforum 19 (January 1981): 43. ↑ Richard Humphreys, Futurism, Movements in Modern Art (Cambridge and New York: Cambridge University Press, 1999) ISBN 0-521-64611-1. Citation on p. 44.